Benjamin (Ben) Hatchett is an Evansville, IN native and recent DePauw graduate of the class of 2017. After focusing his college search efforts close to home in the Midwest he found just what he was looking for in DePauw. His college decision was an easy one after just one visit to campus. He recalls how awestruck he and his family were of DePauw and jokes that they quickly believed they discovered the Hogwarts of the Midwest. Hidden within a small town community, DePauw offered a true college experience that required 100 percent emersion into the campus culture. DePauw enabled Ben an opportunity to learn valuable lessons both inside and outside of the classroom where he created lasting friendships among students, faculty, and staff, all the while having a lot of fun along the way. As an undergraduate student at DePauw, Ben served as both a Coquillette Peer Consultant at the Hubbard Center as well as a First-Year Mentor. He also was a member of the Sigma Chi Fraternity - Xi Chapter and served the fraternity as it’s Treasurer. Throughout these leadership roles, he valued supporting his fellow peers and welcoming all those visiting DePauw’s campus. He always enjoyed helping others achieve their personal and professional goals. Ben looks forward to helping others make DePauw their future home. Ben is an avid runner and sports fan. He recently added the Indy Mini Marathon to his list of accomplishments last May. He is a die-hard Pittsburgh Penguins hockey fanatic, which he proudly shares are the reigning back to back Stanley Cup Champions. Ben enjoys traveling and Vero Beach, Florida is a second home for him and his family. During his four years at DePauw, Ben spent a Winter Term traveling throughout Greece and enjoyed interning and studying for a summer semester at Georgetown University in Washington, DC. 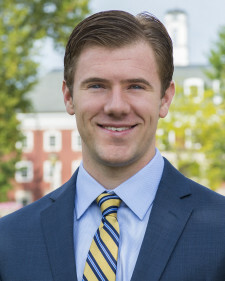 One of Ben’s favorite aspects about his liberal arts education was that it offered a truly unique and personalized experience for everyone on DePauw’s campus. He believes that no two DePauw stories are ever the same, but they share countless commonalities that allow DePauw alumni to connect across generations. Ben fondly regards his DePauw experience as part of an endless bond and legacy that brings so many people together.